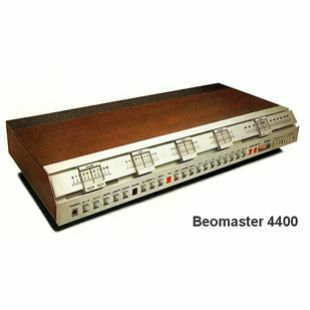 Beomaster 4400 was an advanced high-fidelity FM receiver which represented significant refinements in the design of domestic sound equipment. It incorporated a number of technical innovations and highly creative circuit designs which would not be out of place in a professional unit. In terms of technical finesse and power output, Beomaster 4400 was Bang & Olufsen's top of the line stereo receiver in 1979 - 80. The amplifier's rated output of 75 watts RMS per channel (into 4 ohm speakers) provided more than enough power even in large rooms. 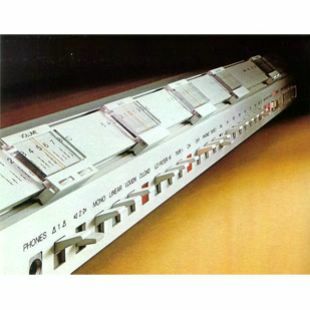 There were DIN sockets for connecting a record-player, two tape or cassette recorders (one socket allowed monitoring), headphones and two pairs of stereo speakers. One pair of speaker outputs could be switched to ambiophonic use. In addition to the more usual controls and adjustment facilities, Beomaster 4400 had switchable high and low filters, a loudness control for physiologically compensated output at low volume settings and a linear function which caused the signal to by-pass all tone and filter circuits for truly unadulterated output. An overload indicator was provided to show when the amplifier's limit for undistorted sound had been reached. Transient Intermodulation Distortion (also called transistor sound) was reduced substantially thanks to carefully designed circuits upon special research at Bang & Olufsen. The tuner was extremely sensitive and had low distortion levels over the entire FM waveband. 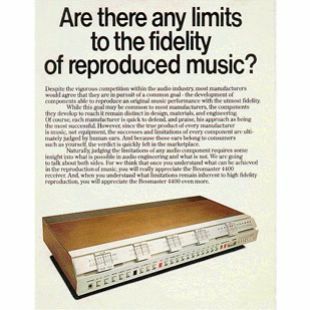 Naturally, it incorporated all the latest technical and scientific advances such as a symmetrical Quadrature detector with the Phase Locked Loop stereo decoder which guaranteed low distortion and long-term channel separation on FM stereo programmes. The AFC (Automatic Frequency Control) circuit had characteristics which reduced inter-station noise during tuning. This circuit was also triggered automatically to eliminate loud 'switch' noise when changing between radio, record or tape programmes. There were six small dials for pre-tuning FM radio stations, so subsequent programme selection was just a matter of pressing a switch. Beomaster 4400 could be made up as part of the Beosystem 4400, when linked together with other compatible Bang & Olufsen products. Beomaster 4401 type 2416 had exactly the same specifications as Beomaster 4000. However the only difference was that it had a black fascia instead of the 4400's silver front.